Stocks closed mixed Friday in yet another day of choppy trading. But before I get to today’s market action, a few words about universal investment truths. Wall Street’s recent volatility makes this a good time to review the basics. As I write this, my parents are staying at our house to enjoy the forthcoming weekend. Don’t get me wrong, I love my folks, but… well, they’re always fretting about whether they’ll outlive their retirement savings. My family comes from New England, where thrift is paramount. Actually, who can blame my parents? We all worry about retirement. We’ve spent years building up a nest egg, but the wrong moves can set us back. If you can afford it, you should delay claiming Social Security benefits. It’s a widely prevalent mistake to start too early. Every year you put off claiming Social Security translates into an annual hike in benefits of 7% to 8%. Try to withdraw from your 401(k), Individual Retirement Account (IRA), or other savings first before tapping Social Security. It’ll take discipline, but you can better leverage your Social Security payments if you wait. When you start taking your monthly Social Security checks, consider if traditional IRA distributions will affect your tax bill. Those distributions count as taxable income and help determine whether your Social Security benefits should be taxed. For married couples filing jointly, those with a combined income of $32,000-$44,000 will pay income taxes on up to 50% of their Social Security benefits. Couples with combined income of more than $44,000 should expect to pay taxes on up to 85% of their Social Security benefits. Retirees who sell taxable assets with substantial unrealized gains will forfeit the advantageous boost in cost basis that their heirs would have received. In such a case, drawing first from a traditional or Roth IRA confers larger tax savings for heirs. Tapping a traditional IRA rather than a Roth is more desirable when a retiree’s tax bracket is lower than the beneficiary’s. Although the money in an IRA grows tax-free, contributions are taxed as ordinary income for you or your heirs. The opposite is true for a Roth IRA, which you should tap first if your tax bracket is higher than the beneficiary’s. Savers fund Roths with taxable dollars, which means the money is tax-free for both you and your beneficiary, but that benefit is more valuable for the person in the higher tax bracket. If you retire before age 59½, you should live on non-retirement plan savings, because early withdrawals from traditional IRAs and 401(k)s incur a 10% penalty in addition to being taxed as income. When you turn 59½, you should rely on traditional IRAs and 401(k)s in your lower-income years, preferably before Social Security or a pension comes into effect, and withdraw non-taxable savings from a Roth IRA for those years when your income is higher. Beware of a scenario that often surprises unwitting retirees: hefty withdrawals from a traditional IRA or 401(k) can generate unintended tax liabilities by hiking your taxable income high enough to preclude your eligibility for other tax breaks that you’d ordinarily have coming to you. For example: a married couple filing jointly with an income of up to $75,300 doesn’t owe tax on qualified dividends and long-term capital gains from investments held in non-retirement savings accounts for more than a year. However, once the couple’s income exceeds $75,300, the tax rate for those earnings rises to 15%. One of the surest methods to reduce the bite of income taxes on dividend payments is to own dividend-paying stocks in tax-advantaged retirement plans, such as 401(k) plans and IRAs. Dividends paid by investments held in these accounts are not subject to dividend taxes. Generally speaking, investors should get more conservative as they get older, mainly because they have fewer working years in front of them. If your portfolio takes a turn for the worse when you’re in your 40s, you still have plenty of time to bounce back. However, if your investments take a nosedive when you’re 65, you’re in a far worse predicament. 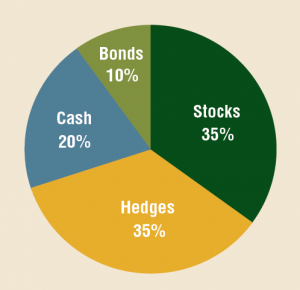 That’s why, as you get older, you should increase your portfolio’s bond weighting. That said, it’s a common mistake to get too conservative. Keep in mind, bond yields fall as interest rates rise. In this rising interest rate environment, a large allocation to bonds may result in significant capital loss. The destructive effect of rising rates on bonds are even worse if you’re a shareholder in a bond fund. A given bond fund will hold up to several thousand individual bonds. When rates rise, shareholders in a bond fund tend to liquidate their shares to avoid losses, which in turn can prompt the fund manager to prematurely sell bonds to raise sufficient cash to meet redemption requests. This dynamic can clobber the average price of a bond fund, called its net asset value. You’re better off adding exposure to stocks that do well in a rising rate environment. We’re also starting to see signs of renewed inflation. By taking on some equity risk, you’ll put your assets on a path to not only outpace inflation but also grow in real terms. Stocks closed mixed today, in a slight recovery from recent sell-offs. Investors were encouraged by strong corporate earnings; consumer staples stocks led the way. However, worrisome economic data from China kept the broader market’s gains in check. Good news came from Procter & Gamble (NYSE: PG), which posted strong earnings. The consumer brands bellwether reported earnings per share of $1.12 versus $1.09 expected. Revenue came in at $16.69 billion vs. $16.46 billion expected. PG shares today soared 8.86%. China’s government on Friday reported that the economy grew by 6.5% in the third quarter. Sure, that’s robust by global standards, but it represents a pronounced slowdown for the world’s second-largest economy. In fact, it’s China’s slowest rate of quarterly growth since early 2009, during the nadir of the global financial crisis. In large part, the escalating trade war is to blame. Wall Street was spooked by the news from China, which exacerbated fears over rising interest rates and the sputtering global economy. Stocks struggled for direction and closed off their session highs. Got a question, investing idea or comment? You can find me at: mailbag@investingdaily.com.